There have been 11 Tomb Raider games since 1996 and that’s not including the spin-offs and mobile games. Tomb Raider has always been a big part of gaming but as the years went by many of the games just didn’t hit that sweet spot that the original 4 did. In 2013 we were surprised with a reboot and it was absolutely amazing. Yes it wasn’t perfect but it took a leap of faith in the right direction. I loved it and I couldn’t wait to see what would come next. 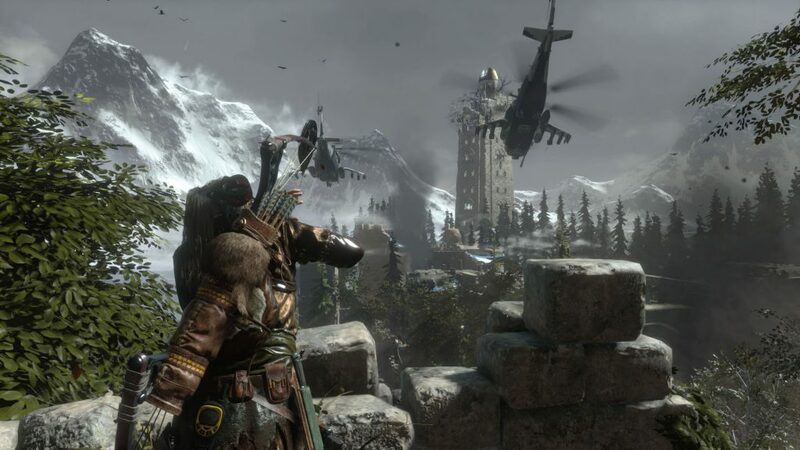 Rise of the Tomb Raider was released as an Xbox One exclusive in November 2015. Did it live up to the success of its predecessor or did it fall flat on its face? I’m happy to say that it is so much better than the reboot in so many ways. While there were a few negative features here and there I got the overall feeling that the developers were comfortable and satisfied with what the achieved with the reboot and that they could take risks. The story picks off after the events of the previous title. Without spoiling too much, Lara’s eyes have been opened to the fact that there may be more to legends and myths than what we may think. The story concentrates heavily on her relationship with her father who died when she was very young. She decides to continue his work on searching for something called The Source which is located somewhere in Siberia. You are thrown into the action almost immediately and the pace remains the same throughout the campaign. I found myself literally commenting to myself about halfway through the campaign that Lara just doesn’t slow down. She just keeps on going. The story was decent but I did predict certain things very early on in the game and I turned out to be correct when the “plot twists” happened. Despite this the story had a very satisfying ending and teased that there will be more to come. The graphics and gameplay mechanics were heavily improved and it made the entire experience so much more enjoyable. I mean just look at how detailed Lara looks in the image above. In the previous title you had to manually activate your torch and while that worked and suited the context of that specific story that wouldn’t have worked in this one. 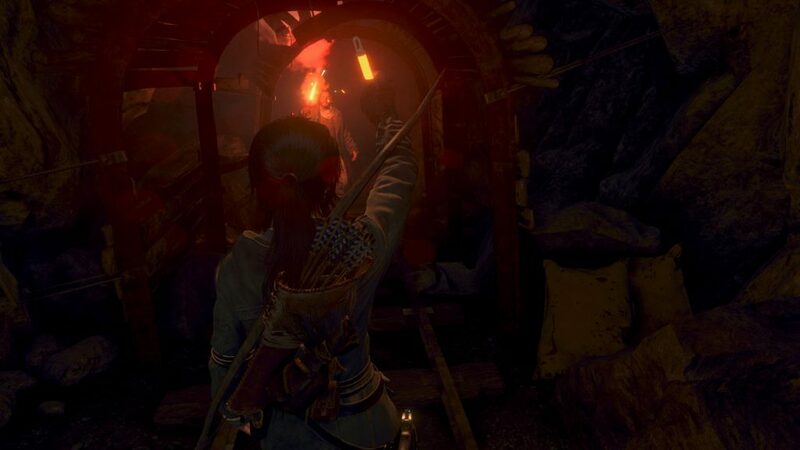 So instead Lara uses glow sticks which she automatically uses when she enters dark areas. The climbing, swimming and traversing mechanics were improved in small ways but it made a huge difference to the overall gameplay. One point of criticism I have is that all the environments were “wet”. There were a lot of snowy environments and yes the story does take place in Siberia, it just got a bit much for me. It also didn’t help that it’s winter here. Even though I can complain about the environments looking cold, I felt even colder while playing which I see as a good thing. The environments were believable and real. 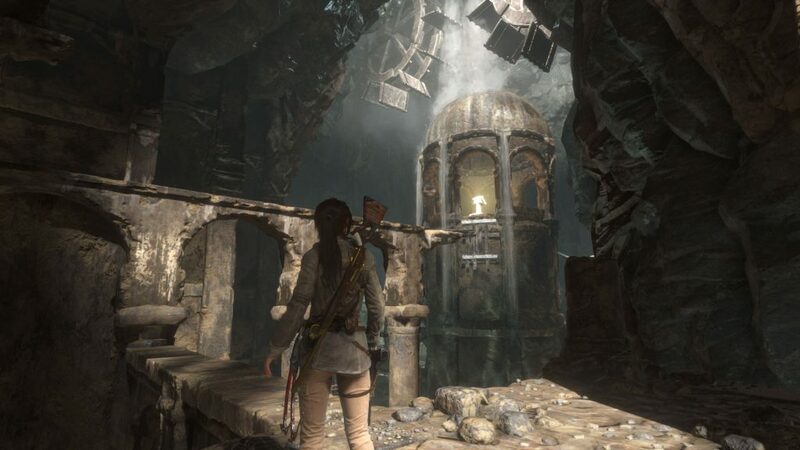 One of the biggest problems with the Tomb Raider franchise was the lack of actual “tomb raiding”. 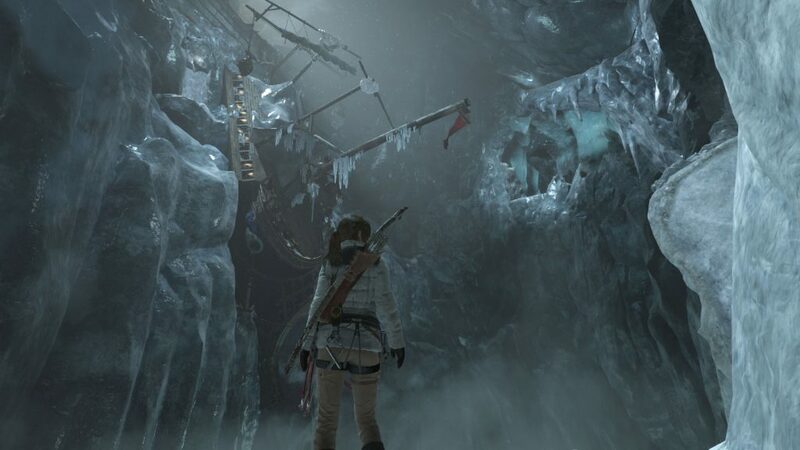 Rise of the Tomb Raider tackled this problem head on by having multiple caves to explore in the free room hub areas. While they didn’t contain much, I was a step in the right direction. The biggest improvement was the heavy emphasis on the hidden tombs throughout the game. While they were deemed optional, completing these tombs gave you really good abilities which were really helpful as the game went on. Speaking of Tombs, each one had a specific theme and a puzzle to solve. Solving the puzzle gave you access to a tome which unlocked an ability. These tombs were incredible and had puzzles ranging from ridiculously easy to medium difficulty. Honestly they weren’t challenging at all. I only got stuck on two tombs but after trying my options a couple of times I eventually figures it out. Completing a tomb was such a good feeling and successfully brought Tomb Raider back to where it should be. I felt like a Tomb Raider again and that made me happy. The skill upgrade system is pretty much the same but the way Lara collects resources and does crafting has been greatly improved. 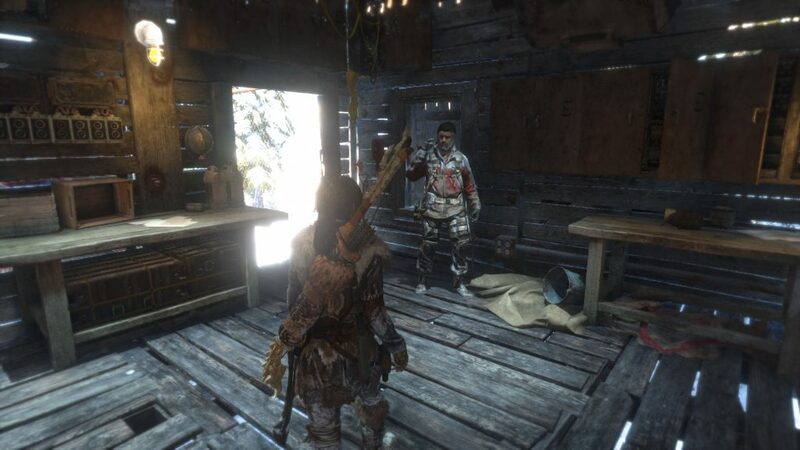 While you can still gain a lot of resources from killing and looting enemy bodies, more emphasis has been placed on hunting and foraging for skins, branches and feathers for arrows, leaves for healing herself and oil, ore and mushrooms for crafting fire, poison and explosive weapons respectively. Your weapons can be upgraded as well and there are various outfits you can craft and wear which offer passive abilities. 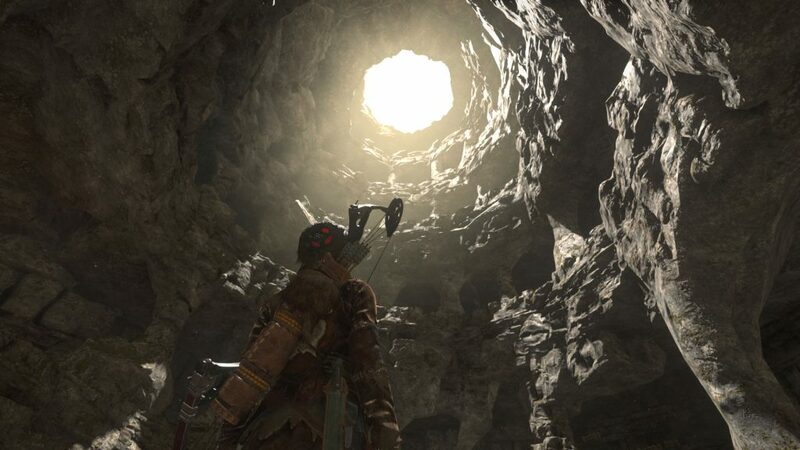 The strong emphasis on hunting and exploring drives home the idea that Lara must survive the environment and situations that she finds herself in. 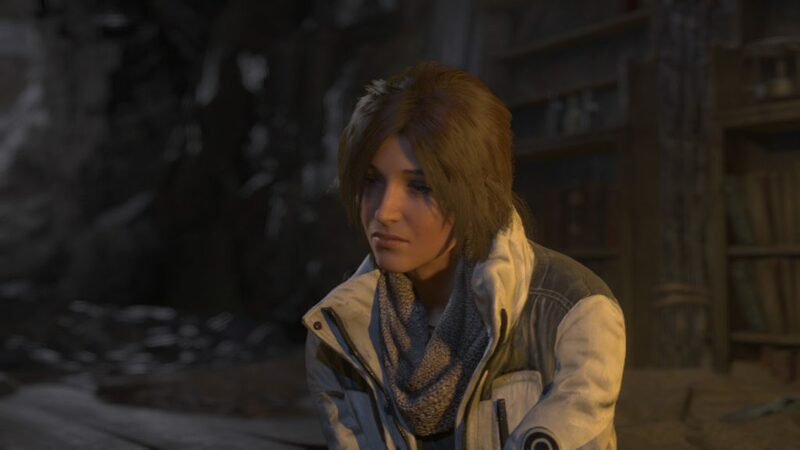 Unlike most games which give the player a sense of being in control and stronger than everything else, Rise of the Tomb Raider gave me the opposite feeling. Only much later on did I feel confident enough to not worry about bears and wolves due to my weapons being almost fully upgraded. The size of the game felt much larger than the previous one. 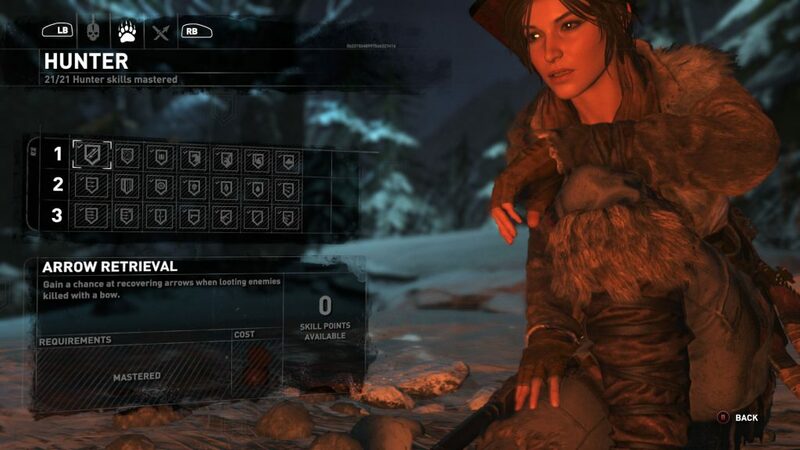 There are three main hub areas where Lara could not only hunt animals like bears, wolves, deer and rabbits but two of these areas had NPCs’ (Non-Playable Character) that would have side missions for her to complete. You were rewarded quite decently for completing these challenges. Besides the side missions, every level had challenges to complete that often required you to explore every nook and cranny. I had to resort to IGN as usual for some assistance on completing everything. There were also documents and relics to collect as well as coin cache’s to dig up which often requires a map to find. Finding some of these maps were easy but some of them were horribly tough. 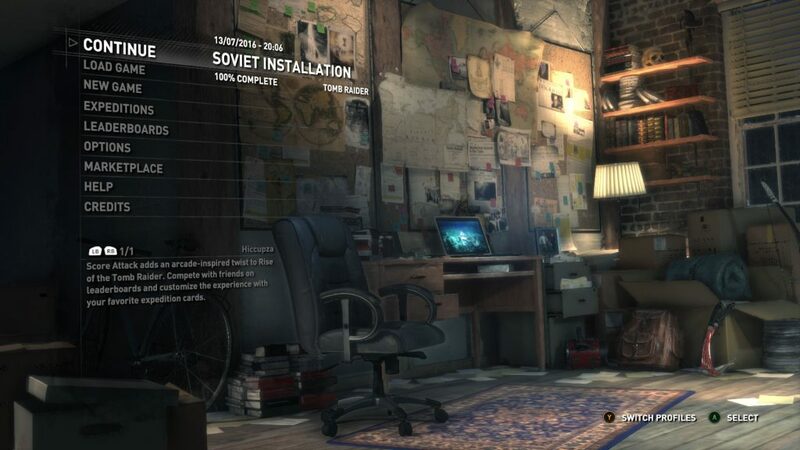 Usually these maps wouldn’t contain the location of all the items to collect and you had to search for a hidden backpack that contained the mission items locations. A new feature that was introduces was the location of a store. This store allowed you to purchase a specific set of items and upgrades. You could only buy these items with coins. You could get coins from the various coin caches hidden in the game. During the beginning section of the game I was only able to afford one or two items but as the game progressed I found more and more coins and I kept going back to buy the remaining items. I enjoyed this because instead of pointlessly collecting coins, I could actually do something with them. Another great improvement is that the map shows and tracks everything that you need to find and collect. This made it so much easier for me as I need to collect and complete everything when I play a game. I can proudly show you in the image below that I completed the game 100%. You will notice that the image above displays the main menu but does not have an option for multiplayer. The multiplayer in the previous game was horrible so I’m actually glad that it was removed all together. Instead a new mode called Expeditions was added. Now, I’ll be honest, I absolutely hate this mode. Within this mode there are a couple of game modes to choose from: Score Attack, Chapter Replay, Chapter Replay Elite and Remnant Resistance. Chapter Replay allows you to replay a chapter of your choice while Chapter Replay Elite allows you to replay a chapter but with all your upgraded skills and equipment. I haven’t tried Remnant Resistance and I probably never will. I did try the Score Attack mode and while I hated every second of it, it wasn’t because of the mode itself but because Cards were introduced for this mode. Cards? Yes cards. You can get cards from card packs which you gain from playing the campaign and earning credit or completing challenges within Expedition mode or buying them with real money. 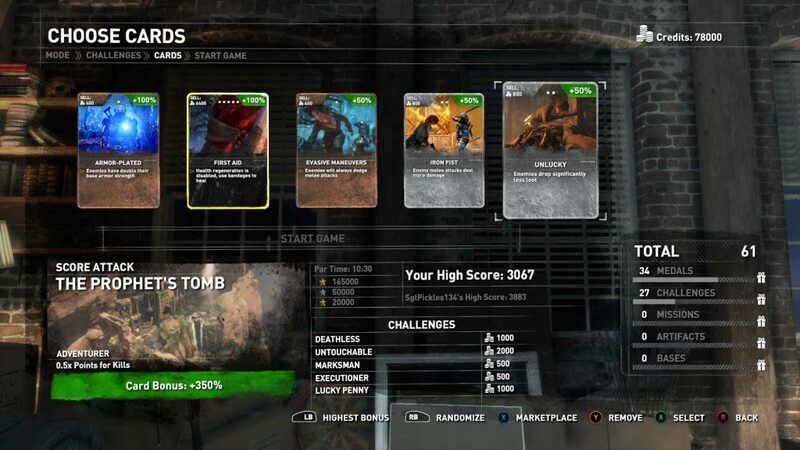 Unfortunately even Tomb Raider isn’t safe from micro transactions. You get 5 cards in a pack and each one has a random effect. These cards are not “collectible” in any way as you get random ones each time which will lead to you having 5 or 6 of the same card. When you play any of the Expedition modes you have the option of adding 5 cards to whatever mission you chose to play. Depending on the card type they can either increase or decrease something called a “Card Bonus”. Successfully completing your mission will add the card bonus to your overall score which will earn you credits to buy more cards. The only reason I even attempted specifically the Score Attack mode was because one of the Xbox achievements was to collect 300 cards. I literally googled to see the quickest way to get this achievement and I ended up replaying a specific tomb roughly 12 times so that I can earn enough credits to buy enough card packs to get up to 300 cards. If it wasn’t for the achievements I would have never even attempted any of the Expedition modes. To me that means that it’s something that does not work well with the game and should be removed. If a player doesn’t naturally feel the need to try out a feature in a game it then means that it’s out of place. While I understand that because multiplayer was excluded that they had to come up with something new, I really hope that they don’t include this in the next Tomb Raider title.